Here’s an easy way to organize, categorize, and integrate the innumerable articles, white papers, case studies, how-to guides, research studies, and the like that you have (or plan to create). With the Content Management Spreadsheet, you get a fully-functional, ready-to-go mini CMS (Content Management System)… without all the cost and complexity or a CMS. In fact, the spreadsheet is totally free. And it will free-up more of your time to strategize, develop new material, and focus on lead gen, instead of admin. 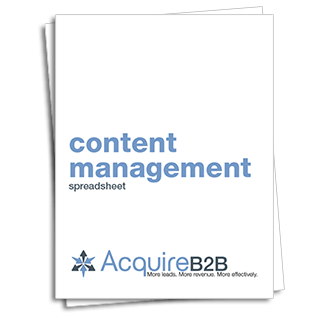 Just complete and submit the form, and your own copy of the Content Management Spreadsheet will download in seconds.